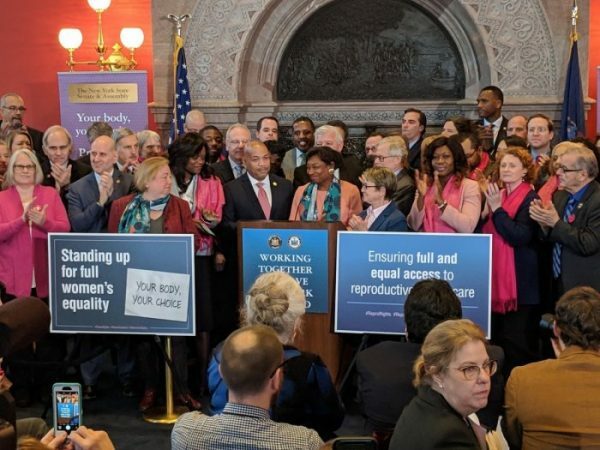 Members of the New York Senate conference celebrate the Reproductive Health Act that legalizes abortion up to birth, for any reason, in Albany, New York, on Jan. 22, 2019. After an intense debate for and against the proposal, the New York state Legislature passed a bill Tuesday that makes it legal for doctors and other health care professionals, such as midwives and physician assistants, to perform abortions up until birth for any reason in the state. The so-called Reproductive Health Act that abortion advocates have been trying to get passed for 12 years and has been vehemently opposed by religious and conservative groups, passed with a 38-28 vote and thunderous applause in the state Senate chamber. The bill codifies federal abortion rights guaranteed under the 1973 Roe v. Wade Supreme Court decision and removes abortion from the state’s criminal code. Abortion was legalized in New York some three years before the Roe v. Wadedecision, but remained on the state’s criminal code, making it a felony to perform late-term abortions according to the Democrat & Chronicle.